Left to right: Shiro Wakita, former WWII Imperial Japanese Navy pilot; Dr. Hiroya Sugano M.D, director general of the Zero Fighter Admirers Club; Jack Detour, former colonel and World War II Army Air Force B-25 pilot; Jerry Yellin, former captain and World War II Army Air Force P-51 pilot, pour bourbon whiskey at the 6th annual Blackened Canteen Ceremony at the USS Arizona Memorial during the 75th commemoration of the attacks on Pearl Harbor. The blackened canteen is a relic of an air raid over Shizauoka, Japan in 1945. It is used for pouring bourbon whiskey as an offering to the fallen in the hallowed waters of Pearl Harbor. Dec. 7, 2016 marks the 75th anniversary of the attacks on Pearl Harbor and Oahu. 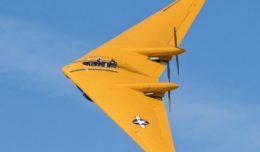 Since Dec. 7, 1941, the U.S. and Japan have endured more than 70 years of continued peace, a cornerstone of security and prosperity in the Indo-Asia-Pacific region. As a Pacific nation, the U.S. is committed to continue its responsibility of protecting the Pacific sea-lanes, advancing international ideals and relationships, well as delivering security, influence and responsiveness in the region. Down below, more than 2,000 Shizuoka citizens also perished in the raid. The horror of war had reared its head once again. According to historical accounts, the flames of the wreckage served to illuminate this blackest of nights. From this tragedy emerged the tradition of the Blackened Canteen, an artifact recovered from the wreckage site the next morning by Fukumatsu Itoh. Itoh was a Shizuoka citizen who survived the raid. Dr. Hiroya Sugano, a child at the time of the raid, was also out that day observing the wreckage site with his family. The sense of grief was practically tangible, Sugano recalled. The canteen, scarred and bruised, though still intact, bore the handprint of what Itoh imagined was the canteen’s owner. 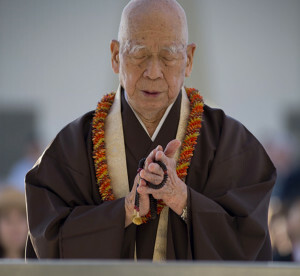 As per his devotion to Buddhism, Itoh coordinated a proper burial for the American crewman alongside Shizuoka residents who also lost their lives that day. This began a tradition of honor that echoes to this day via the annual Blackened Canteen ceremony, held around the anniversary of the Pearl Harbor attacks. Initially, every year, Itoh would visit the B-29 crash site to honor both the American crewman and the citizens of Shizouka with the pouring of bourbon whiskey from the canteen onto the ground. According to Itoh, this honored the spirits of the fallen. Over time he weathered criticism and outright scorn for his actions from his countrymen, but Itoh would not be deterred from his yearly homage to the fallen. To Itoh, this was part of the forgiveness and healing process. In time, Sugano would take over this tradition from Itoh. In 1991, he started a yearly journey to Pearl Harbor, to visit the USS Arizona Memorial and expanded upon Itoh’s tradition by pouring whiskey from the canteen into the waters surrounding the memorial. Together, the tradition set forth by Itoh and Sugano helped parallel the long, peaceful relationship between the U.S. and Japan that continues to this day. In 2016, for the 75th anniversary of the Pearl Harbor attacks, the 6th annual Blackened Canteen ceremony at the USS Arizona Memorial saw the tradition’s most impressive turnout yet. Itoh’s dream of peace and reconciliation, in that moment of darkness, was realized in full as the sun rose over the waters of Pearl Harbor. An audience of veterans and spectators from the United States and Japan attend the 6th annual Blackened Canteen ceremony at the USS Arizona Memorial during the 75th Commemoration of the attacks on Pearl Harbor. 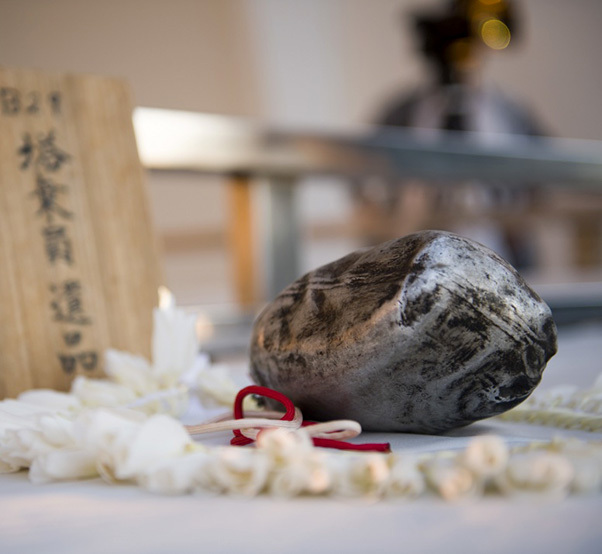 Following a hymnal from Dartmouth College Choir, Ken DeHoff, the executive director of the Pacific Aviation Museum in Pearl Harbor, spoke of the Blackened Canteen ceremony’s significance as proof of how far the United States and Japan have come since World War II. Sugano, wearing a traditional Hawaiian lei, spoke with a hushed reverence, humbled by the turnout and expressed his appreciation to the attendees. Sugano’s remarks punctuated over seven decades of ongoing peace and prosperity that has been a cornerstone of the U.S.-Japan alliance. After the remarks, Sugano, Ashwell and Dehoff led two groups of dignitaries to the open well of the memorial and each poured ceremonial whiskey from the canteen into the waters of the USS Arizona wreckage site, which sparkled in the morning sun. Bishop Ryokan Ara of the Tendai Mission in Honolulu, Hawaii, delivers a blessing during the 6th annual Blackened Canteen ceremony at the USS Arizona Memorial during the 75th Commemoration of the attacks on Pearl Harbor. Once the whiskey had been ceremonially dispersed, the attendees lined up to toss traditional plumeria blossoms into the well. Within a moment, the waters were blanketed in flora, a final offering to the spirits of the fallen. 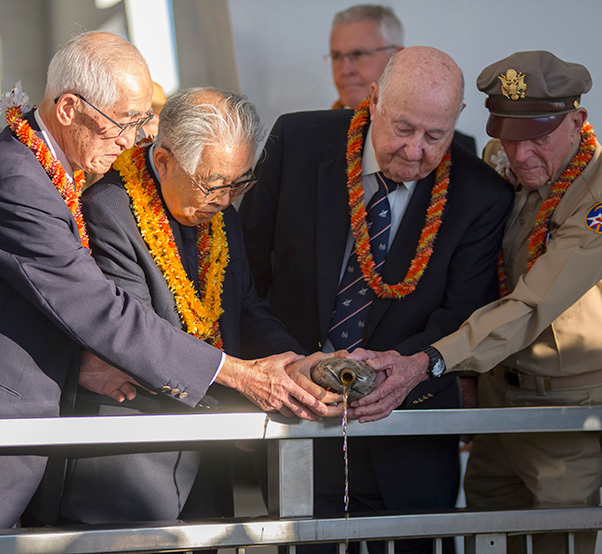 From below, the crew members of the USS Arizona were honored with the sight of hundreds of blossoms fluttering down into the water as U.S. and Japanese survivors of war stood together, united today by peace, friendship and forgiveness.